# Break the 3 eggs into a deep bowl, add 1 cup granulated sugar into it, blend the mixture until it turns to bubbles. 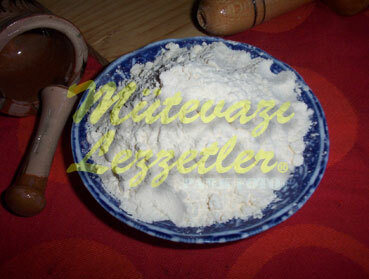 # Add melted and cooled margarine, sifted flour, vanilla and baking powder into the mixture, whisk it well. # Pour the mixture into the cake mould which is greased and floured, square shaped cake mould is advised to use, bake the cake in 347 F oven for 50 minutes. # Prepare the cream while baking the cake. Put the milk into the pot, add flour and sugar into it, then mix it. # Place the pot over medium heat. Cook it by stirring constantly until it reaches to the right consistency. Add the grated tangerine rind and vanilla when the mixture reaches to the right consistency, stir, remove it from the stove and let it cool down. # Transect the cake into 3 pieces after removing it from the oven, wet the first layer of the cake with the mixture of sugar and water, place half of the cream on it. # Place the second the layer of the cake onto the cream, wet it with the sugared water also, and spread the remaining cream. # Close the remaining cake layer onto the cream, and wet it with sugared water also. Place the cake into the refrigerators lowest layer. # Prepare the mixture for upper side; put the tangerine juice, starch, water and granulated sugar into the pot, cook until the mixture reaches to the consistency which is thicker than milk pudding. # Remove the cake from the refrigerator, spread the tepid mixture for upper side to cover the cake, garnish the cake with tangerine slices and with remaining cream. # Refrigerate it for 4 hours at least and then serve. Note: Tangerine mixture used instead of jelly to garnish the cake for making it healthier.